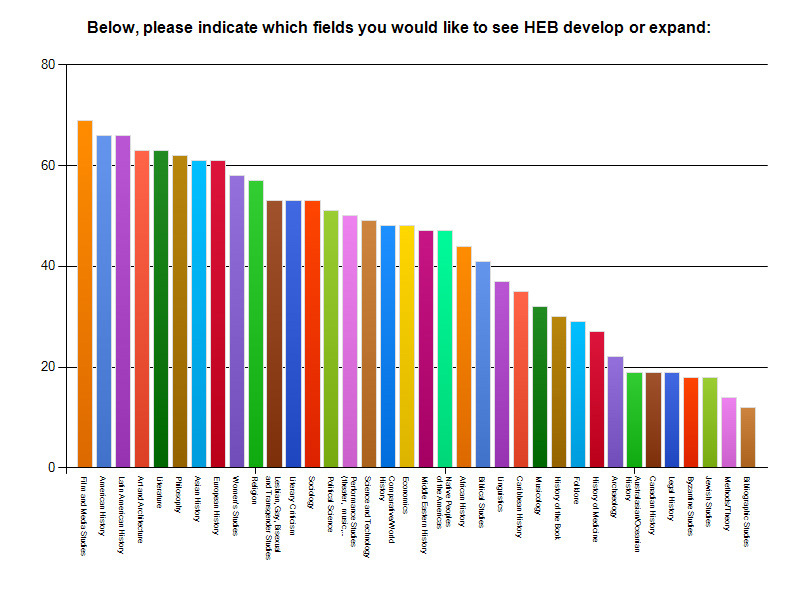 HEB recently asked its subscribers to take part in a survey designed to assist us in expanding our title list to reflect current interests in scholarship and adding to any underrepresented areas. In response we received feedback from 185 participants at subscribing institutions. Those areas generating the most interest included several that are already prominently featured or traditionally strong in the HEB collection, such as European History and U.S. History. The top five fields of interest to participating subscribers were Film and Media Studies, American History, Latin American History, Art and Architecture and Literature—though each of the remaining thirty-one options was also selected a number of times. These results seem to indicate that, for one, maintaining the current breadth and diversity of our humanities offerings is essential; and furthermore, that certain core fields have remained popular over the span of HEB’s ten-year existence and our subscribers would like to see these continue to grow. We had also asked survey participants to suggest new areas to explore and specific titles they would like us to consider adding. These too covered a wide variety of fields, including mythology/esoterica, non-western religion, gender studies, ecology, cultural studies, psychology, and other categories that, while not strictly falling under the mantle of a humanities-oriented initiative, may include some cross-over. These findings will be used by HEB to continue to develop our collection over the coming years. We thank everyone who took part in the survey.